Warner Orchards will have Springcrest Peaches this week. 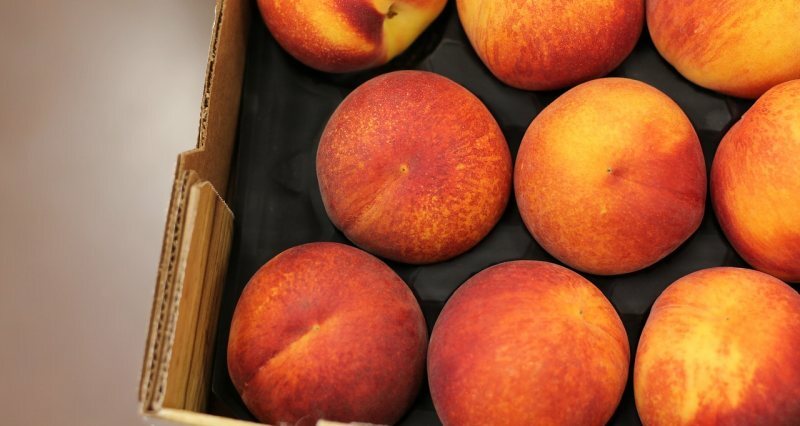 This is an early season semi-freestone peach where the flesh of the peach partially clings to the pit and is excellent for eating out of hand. Peach fuzz isn’t your thing? They will also be bringing nectarines. Peaches and nectarines provide a great deal of nutrients with few calories and no fat. This is an easy time of year to get in your daily servings with these juicy and delicious stone fruits. 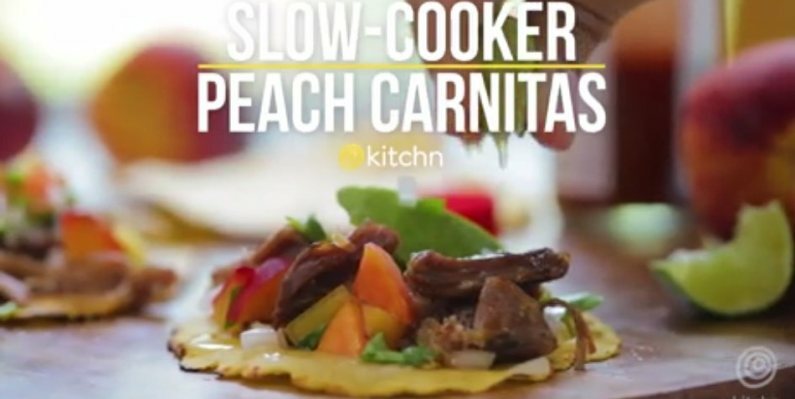 Try this recipe for delicious Slow Cooker Pork Carnitas from the Kitchn. It shows how versatile peaches are by adding perfectly matched sweet to savoury ingredients. Meander over to VanDenbroek Farms wagon and you will be sure to find some of the other ingredients to cross off your shopping list. They are all about the sweet corn and field tomatoes this week which would go fabulous with the Carnitas. There you go, a beautiful summers day dinner done – boom. Click image to see full recipe and instructional video. 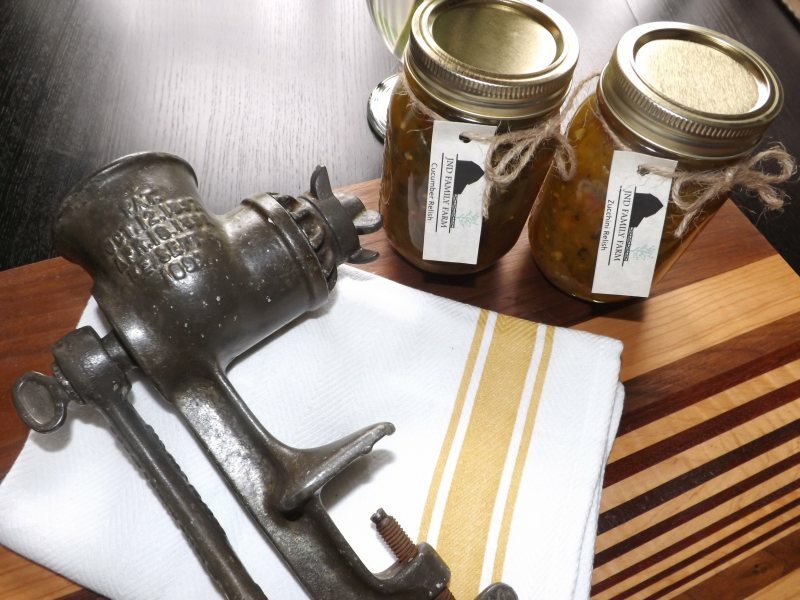 This week JND Family Farm will be offering a sample of one of their preserves – Zucchini Relish. It is one of their secret recipes that they have now perfected over four generations. The vegetables used are home grown and hand ground using an original Universal Food Processor patented in 1897. The family has kept with the traditional way of making relishes as it provides the best results as opposed to the electrical appliances found in the kitchen. Though the processes may take a bit longer, and they often find themselves fighting back the tears when grinding the onions, the end result is very rewarding! Both their cucumber and zucchini relishes are a perfect pairing for hot dogs, hamburgers or as a topping for your favourite sandwich. Come visit their table and find out more while enjoying the tasty sample! YUM. Here’s a heads up that at the Lincoln Mushrooms table you can purchase County of Wellington user pay garbage bags. Large $20.00 and small $15.00. Save yourself some time by checking that stop off your list. And don’t leave without some of their farm fresh mushrooms. Come support this local market at the Aberfoyle Farmers’ Market, at the Optimist Recreation Centre’s outdoor pad, 23 Brock Road S in Aberfoyle, next to the Puslinch Community Centre. Saturday, July 29 from 8am to 1pm.